Despite the fact that the great American pastime has been almost exclusively identified as a male sport, women have played baseball in Minnesota for over 100 years. In the early years, from the late nineteenth century through the 1920s, women played baseball in Minnesota on college campuses, in industrial leagues, through local church and community groups, and on barnstorming teams. In 1944, Minnesota was home to a professional women’s baseball team, the Minneapolis Millerettes, one of six teams in the All-American Girls Professional Baseball League, made famous through the film A League of Their Own. In more recent years, left-handed pitcher Ila Borders played on the St. Paul Saints and Duluth Dukes independent league baseball teams, while numerous girls across the state have played Little League and high school baseball. 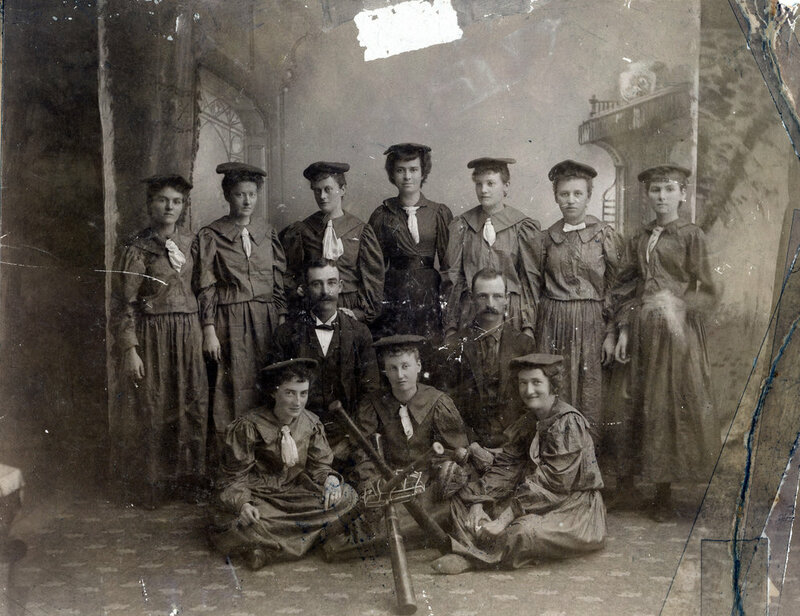 This article focuses on women’s baseball in Minnesota from the 1890s through World War II. The earliest evidence that women played baseball in Minnesota is a photo from Thief River Falls, dated 1893, of ten female players with two male player-managers. The note accompanying the photo reads, “Thief River Falls Ladies Baseball Team Champions of Northern League, 1893.”1 This note suggests that there were multiple women’s teams playing competitively at this time. Baseball historians Gai Berlage, Harold Seymour,2 and others have documented that women played baseball as early as 1865 at Vassar College. In the Thief River Falls photo, the women are wearing the same type of long dresses with long sleeves worn by women in the early pictures of Vassar baseball teams, adhering to the Victorian standard of feminine modesty. Baseball was also played by women at Carleton College in Northfield, starting around 1915. In 1916, there were four baseball teams, each representing a class, from freshman through senior. By 1922, the intramural women’s baseball program was well established. A May 17, 1922 article in The Carletonia listed the lineups for the four teams as they headed into the end-of-year tournament. The teams consisted of ten players, including two shortstops. Surprisingly, the freshman team won the championship by defeating the juniors in the final game by a score of 25–24. Baseball at Carleton was typical of the women’s game in this time period. It was played indoors at least part of the time, although there are references to outdoor play as well. Indoor baseball, a precursor to softball, was a popular sport for girls and women in the 1920s. Women’s baseball at Carleton was also typical in that it featured intramural, not intercollegiate play. According to Jenny Ring, intercollegiate play was off limits for women because “too much competition was regarded as unhealthy for girls,” and “travel was also believed to be too strenuous and unsuitable for the health and morality of the young women.”4 Finally, by 1922, Carleton women were playing in bloomers rather than long skirts, an evolution that was typical of women’s baseball during this time period. Women also played baseball on Minnesota soil when, starting in the late nineteenth century, barnstorming teams visited the state. These teams were called “Bloomer Girls,” and they went from town to town all over the country, challenging men’s amateur, minor league, or semi-professional teams to games. The bloomer teams usually had two or more men as members, and sometimes the men dressed as women. The term “bloomer” is derived from the name of the mid-nineteenth century advocate for women’s rights, Amelia Jenks Bloomer, who argued that women should have the option of wearing less restrictive clothing. 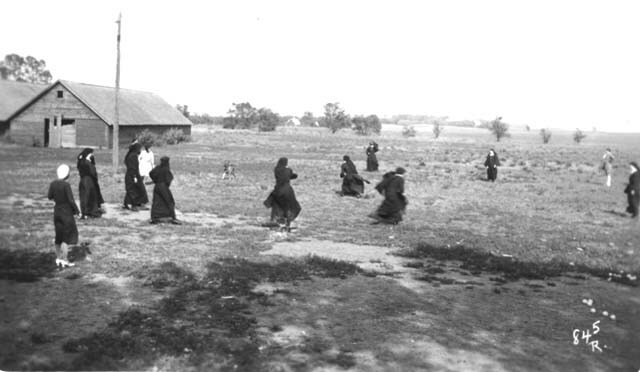 Bloomer Girls teams came from Chicago, Boston, Canada, and elsewhere to play games in Minnesota communities. An early appearance by a women’s barnstorming team occurred in 1895, when the Ladies Champion Baseball Club of Chicago visited Duluth. In 1909, the Chicago Bloomer Girls came to Bemidji to play a game against the town team. The article in the Bemidji Daily Pioneer previewing the game notes that a “record-breaking crowd” was expected.5 The captain and proprietor of the team was Miss Bernie Carleton. Carleton was among several women who managed and owned barnstorming teams, an unusually powerful role for women during this time period. Several photographs from the Minnesota Historical Society suggest other venues for women’s baseball in the state. A series of photographs from 1931 taken by Father Robert E. Russell in Leavenworth, Minnesota, capture nuns in full habit playing baseball and posing for a team photo with a bat. Another photo dated 1926 features 10 young African American diamond ball players from the Phyllis Wheatley Settlement House, a community center that still exists in North Minneapolis and is the oldest organization in Minnesota with continuous service to the African American community. One of the women in the photo is Ethel Ray Nance, daughter of the president of the Duluth chapter of the NAACP. Nance became the first African American policewoman in Minnesota, and later worked for civil rights activist and author W.E.B. Du Bois. She is considered an important figure in the Harlem Renaissance. The diamond ball played by the young women at the Phyllis Wheatley Settlement House in 1926 probably resembled modern day softball more than it resembled hardball. That’s because softball, sometimes called “kittenball” or “mush ball,” emerged in the 1920s as the preferred diamond sport for girls and women. The 1929 book, Baseball for Girls and Women by Gladys Palmer, professor of physical education at Ohio State University, details the transition from baseball to softball during this period. The book focuses on a sport that featured underhand pitching and smaller base paths, but it also identifies four different versions of the sport, one of which used a nine-inch ball and overhand pitching. By the 1940s, the transition from baseball to softball was complete, and the newer sport became wildly popular among both women and men across the U.S. and Canada. In 1943, Philip K. Wrigley, fearing that the manpower shortage caused by World War II would harm major league baseball and his own fortunes as owner of the Chicago Cubs and Wrigley Field, capitalized on the abundance of female softball talent by establishing the All American Girls Professional Baseball League (AAGPBL). In this early phase of the league, the game was a hybrid of softball and baseball. It featured underhand pitching, for example, but it also allowed leading off and stealing bases, forbidden in regulation softball. League managers felt that base stealing would make the game more attractive to fans. The Millerettes were chock full of rookies who brought outstanding softball and other athletic credentials to the team. According to Barbara Gregorich, some of the rookies from California had played softball in front of crowds as large as 30,000.14 The Millerettes’ manager was Clarence “Bubber” Jonnard, who had been a catcher for a number of major league teams and a coach for the New York Giants and Phillies. The season got off to a robust start. By the end of the second week, the Millerettes were in second place in the six-team league, with a record of nine wins and six losses. Fans were particularly interested in hometown players Lorraine Borg and Peggy Torrison, who had excelled on Twin Cities softball teams before trying out for the AAGPBL. The Millerettes were still drawing positive attention on June 16–17 when they hosted a weekend series against the Racine Belles. The June 16 game lasted 15 innings, with the Millerettes’ star pitcher, Dorothy Wiltse, tossing 10 2?3 no-hit innings. The home team ended up losing the game, 3–2, but took their revenge the next day when they faced the Belles again. With a tie game in the bottom of the ninth, Helen Callaghan and Judy Dusano were on second and third. Pep Paire stepped up to the plate and “slashed a hard one at third sacker English. Maddy came up with a good stop, but the flying Helen beat her throw to the plate in a split-hair play.”16 The Millerettes won, 7–6. Despite some early successes, by July 5 the Millerettes were in last place, and by July 23 they had played their last game in Minnesota. Concerned about the cost of bringing teams to Minneapolis from as far away as South Bend and the low attendance at Nicollet Park, the league decided to reschedule the Millerettes home games to the road. For the remainder of the 1944 season, the team became the “Minneapolis Orphans.” The Minneapolis Tribune quoted league president Ken Sells, who said that the other teams “objected to making the trip to Minneapolis because of the heavy traveling expenses with such small crowds attending the games.”17 The Millerettes ended the year in last place, although there were some bright spots. One was the league’s first perfect game, pitched by Millerette Annabelle Lee on July 29. This shining moment, however, could not stave off the demise of the team. For the 1945 season, the team was moved to Indiana, where they remained for ten years as the much-appreciated and very successful Fort Wayne Daisies. Why was attendance so poor at Millerette games compared to that of cities like Racine and Rockford? Some might argue that the Millerettes failed because of their poor play later in the season, but this seems unlikely because the Milwaukee Chicks, the other team that met its demise at the end of the 1944 season, won the league championship. In addition, many of the players on the Millerettes went on to become standouts on other teams. Merrie Fidler, the leading historian of the AAGPBL, argues that there are a number of possible reasons for the Millerettes’ struggles.18 First, the two expansion teams, the Millerettes and the Milwaukee Chicks, played on fields built for American Association minor league teams, which was not the case for the original four teams of the AAGPBL. The sharing of Nicollet Park with the Minneapolis Millers may have invited a direct comparison between the two teams, one that did not favor the Millerettes. Even ticket prices were an issue. A telephone poll in Milwaukee suggested that fans were dissatisfied with the ticket prices for the AAGPBL games compared to the prices for the American Association games. Beyond the competition with men’s minor league ball, the big cities of Minneapolis and Milwaukee offered numerous other sports and entertainment options that might have undermined the success of the Millerettes. Dorothy Wiltse Collins was one of the best pitchers in the history of the league. A New York Times obituary described her hurling prowess: “She pitched underhand, sidearm and overhand; she threw curveballs, fastballs and changeups.”21 During her rookie season with the Millerettes, she won 20 games with a 1.88 ERA. In 1945, pitching for the Fort Wayne Daisies, she pitched two games of a doubleheader and won them both. If that weren’t enough, she repeated this feat eight days later, giving up a total of two runs over all four games. Wiltse had a career record of 117–76 and an ERA of 1.83. She won 20 games or more during each of her first four seasons. Faye Dancer was an exceptional athlete, an entertainer on the field, and a prankster off it. During her year on the Millerettes, she batted .274, the third highest average in the league. She also hit two grand slam home runs, knocked in 48 runs, and stole 63 bases. In 1948, she stole 102 bases. She was well known for her base running panache and her superb skills in catching fly balls. Halsey Hall referred to the “ground-covering, fly-catching genius” of Dancer in center field.22 She also made her mark through her antics on and off the field. Out in center field she would do cartwheels, splits and handstands; off the field, she played tricks on other players and especially on new chaperones—for example, replacing the cream in their Oreos with toothpaste. Given her abundance of chutzpah and personality, it is not surprising that Dancer was the inspiration for Madonna’s “All the Way Mae” character in A League of Their Own. Helen Callaghan St. Aubin, from Vancouver, Canada, played on the Millerettes alongside her sister, Margaret. Callaghan was a star batter and base stealer. Her .287 batting average was second in the league in 1944. In 1945, at 5-foot-1 and 115 pounds, she the paced the league in doubles and tied for the lead in home runs. One of her sons, Casey Candaele, played for nine seasons in the major leagues. While Candaele swung a bat that was 33 inches long and 32 ounces, his mother’s bat was 36 inches long and 36 ounces.23 Another of Callaghan’s sons, Kelly Candaele, made the documentary, A League of Their Own, which led to the 1992 film by the same name. Annabelle Lee Harmon grew up in California and was recruited for the AAGPBL in 1944 by Bill Allington, who managed teams in the AAGPBL every season from 1944 until the league folded in 1954 (except 1947). She distinguished herself as a left-handed pitcher for the Millerettes by throwing the league’s first perfect game on July 29, 1944, against the Kenosha Comets. The next year, as a member of the Fort Wayne Daisies, she threw a no-hitter. Lee’s career ERA was 2.25, and she was known for throwing a wicked knuckleball. Like Dorothy Wiltse Collins, she was one of the few pitchers who adjusted to the transition from underhand pitching in 1944, to sidearm pitching in 1946, and then to overhand pitching in 1948. Her nephew, Bill “Spaceman” Lee, pitched for the Montreal Expos and Boston Red Sox in the 1970s and 1980s. Fortunately, numerous women ignored Spalding’s declaration that baseball was off limits for women. Starting in the late nineteenth century, they grabbed bats, balls, and mitts and played the game hard throughout the state of Minnesota. Refusing to remain in the grandstand, they defied stereotypes, resisted sexism, and asserted their right to take part in the beloved American pastime. ANNE ARONSON is a professor of writing, rhetoric, and communication at Metropolitan State University in Saint Paul, Minnesota, where she coordinates the professional writing program. She has written articles on women’s baseball for "Elysian Fields Quarterly," the "Star Tribune," and the book "Minnesotans in Baseball." She recently started teaching a class on gender, sport and the media. Barrouquere, Peter. “Mom Was Provider, Hero, Role Model to Candaele.” Times-Picayune, August 30, 1998. “Baseball for ‘U’ Co-Eds,” Minneapolis Journal, March 17, 1906. Berlage, Gai. Women in Baseball: The Forgotten History. Westport, CT: Praeger, 1994. “Bloomer Ladies Will Play Here on Sunday,” Bemidji Daily Pioneer, August 7, 1909. “Comedy for Fans When Bloomer Girls Lose to Minneapolis Athletics.” Minneapolis Morning Tribune, July 30, 1916. “Duluth Has the Honor of Having ‘Something New’: City is One of Few in Country Who Have a Girls’ Baseball League.” Duluth News Tribune, July 20, 1919. Fidler, Merrie. The Origins and History of the All-American Girls Professional Baseball League. Jefferson, NC: McFarland, 2006. Galt, Margot. “The Girls of Summer.” Minnesota Monthly, May 1991. Goldstein, Richard. “Dottie Collins, 84, Star Pitcher of Women’s Baseball League, Dies.” New York Times, Aug. 17, 2008. Gregorich, Barbara. Women at Play: The Story of Women in Baseball. San Diego: Harcourt Brace, 1993. Hall, Halsey. “Millerettes ‘Uncurled’ 5–4.” Minneapolis Tribune, May 28, 1944. “Local Baseball Team Decidedly Ungallant,” Bemidji Daily Pioneer, August 9, 1909. Palmer, Gladys. Baseball for Girls and Women. New York: A.S. Barnes and Company, 1929. Ring, Jennifer. Stolen Bases: Why American Girls Don’t Play Baseball. Urbana, IL: University of Illinois Press, 2009. Seymour, Harold. Baseball: The People’s Game. New York: Oxford, 1990. Thornley, Stew. Baseball in Minnesota: The Definitive History. St. Paul: Minnesota Historical Society Press, 2006. United Press. “It’s Powder Puff Baseball in Nicollet Opener Today.” Minneapolis Tribune, May 27, 1944. 1. Courtesy of the Pennington County Historical Society. 2. While Harold Seymour is the author of record for The People’’ Game, which includes five detailed chapters on women’s baseball, Dorothy Jane Mills, Seymour’s wife at the time, convincingly describes how she was the main researcher and writer for these chapters. See Dorothy Jane Mills, A Woman’s Work: Writing Baseball History with Harold Seymour, (Jefferson, NC: McFarland, 2004). 3. Minneapolis Journal, March 17, 1906, 2. 4. Jennifer Ring. Stolen Bases: Why American Girls Don’t Play Baseball. (Urbana, IL: University of Illinois Press, 2009) 35. 5. Bemidji Daily Pioneer, August 7, 1909, 1. 6. Bemidji Daily Pioneer, August 9, 1909, 1. 7. Minneapolis Morning Tribune, July 30, 1916, B1. 8. Barbara Gregorich. Women at Play: The Story of Women in Baseball. (San Diego: Harcourt Brace, 1993) 6. 9. Minneapolis Morning Tribune, April 21, 1911, 4. 10. Duluth News Tribune, July 20, 1919, Section 2, 1. 11. Merrie Fidler. The Origins and History of the All-American Girls Professional Baseball League. (Jefferson, NC: McFarland, 2006) 21. 12. Minneapolis Tribune, May 27, 1944, 61. 13. Halsey Hall. “Millerettes ‘Uncurled’ 5–4.” Minneapolis Tribune, May 28, 1944. Sports, 1. 14. Gregorich, op cit. 108. 15. Margot Galt, “The Girls of Summer.” Minnesota Monthly, May 1991, 52. 16. Minneapolis Tribune, June 18, 1944, Sports, 1. 17. Minneapolis Tribune, July 23, 1944, Sports, 1. 18. Fidler, op. cit. 46–48. 19. Fidler, op. cit. 46 (2). 20. Quoted in Stew Thornley, Baseball in Minnesota: The Definitive History. (St. Paul: Minnesota Historical Society Press, 2006) 169. 21. Richard Goldsteing “Dottie Collins, 84, Star Pitcher of Women’s Baseball League, Dies.” New York Times, August 17, 2008, A22. 22. Hall, op. cit. Sports 1. 23. Peter Barrouquere, “Mom Was Provider, Hero, Role Model to Candaele.” Times-Picayune, August 30, 1998, C1. 24. Spalding, quoted in Gladys Palmer, Baseball for Girls and Women. (New York: A.S. Barnes and Company, 1929) 10.